Jessica Heide grew up in the pacific northwest. Living in this environment, she found it difficult to not fall in love with the natural world around her. From the local forests to the marine life of puget sound, there was an abundance of beauty to be found. These passions lead her to get her Bachelors of Science in biology from the University of Washington. 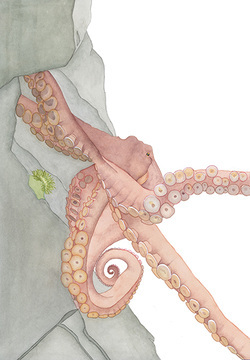 In 2014 she expanded her education, earning her certification in Natural Science Illustration. She has experience working with a variety of mediums including colored pencil, watercolor, gouache, and ink. Jessica would love to create something for you. Please visit her website at jessicaheide.com to learn more.